Today I’m focusing on a block of 29 seats in the eastern half of Sydney. This area doesn’t really identify as “eastern Sydney” but could be defined as a number of smaller regions: the inner west, eastern suburbs, north shore, northern beaches, St George district and the Sutherland Shire. If you look across the whole of Sydney, there are three bands of electorates: Liberal seats along northern Sydney from Manly to the Hills district and Hawkesbury (let’s include Vaucluse as an honorary north shore electorate), Labor seats from Maroubra to Londonderry, and Liberal seats on the southern end of the city, in the Sutherland Shire, on the Georges River, and the south-western fringe of the city. All but one marginal seat in the city lies on the edge of one of these bands. The only exception is Heathcote, which borders a block of Labor seats in the Illawarra region. In the eastern half of Sydney, seats of interest tend to be most concentrated close to the city in the inner west and eastern suburbs. There are no seats of interest on the north shore, and then there is also Oatley in the St George district and Heathcote at the southern end of the Sutherland Shire. Half of these seats of interest are non-classic electorates held by Greens or independents. The most marginal Liberal seat in this region is the eastern suburbs seat of Coogee. This beachside electorate was won by Liberal Bruce Notley-Smith in 2011. Notley-Smith held on by 2.9% in 2015. The seat is a relatively strong seat for the Greens, who have harboured ambitions of coming in the top two, but this seems unlikely in 2019. Labor would be hoping to win this seat as part of depriving the current government of a majority. While Coogee is part of a group of seats held by very small margins, Oatley is in the next group, on a margin of 6.6%. Liberal Mark Coure won the seat in 2011 and increased his margin in 2015. This seat covers parts of the St George district on the north side of the Georges River, including Peakhurst, Penshurst and Riverwood. Heathcote covers the southern end of the Sutherland Shire along with a small part of the City of Wollongong, and is held by Liberal MP Lee Evans by a 7.6% margin. This is one of the seats that could put Labor in an election-winning position, even if they don’t win a majority, and there’s evidence that the Liberals are putting in a big effort to hold on. The Greens’ Jamie Parker holds Balmain by a 4.7% margin. This electorate covers the Balmain peninsula and other nearby suburbs. Parker won the seat in 2011, and strengthened his hold in 2015. Conventional wisdom suggests that the Greens will win a third term here, but Parker is not very safe and could be vulnerable if Labor’s campaign goes well. Independent MP Alex Greenwich holds the seat of Sydney by an 8.1% margin. Greenwich won the seat at a 2012 by-election following the resignation of lord mayor Clover Moore, who was forced to pick between her two jobs. Greenwich is an ally of Moore’s and has benefited from her personal vote. It doesn’t seem likely that he would lose but he polled less than 40% of the primary vote in 2015 so this isn’t a seat where you can be sure of the independent hold. The Greens’ Jenny Leong holds Newtown by a 9.3% margin, which is about as safe as any Greens lower house seat has ever been. She is probably safe, but the interactions between Labor and Greens aren’t as predictable as the major party contest. A resurgent ALP and a conflict-ridden Greens may hinder the Greens campaign here. Labor is putting minimal effort into Drummoyne. The candidate wasn’t announced until near the end of January. I assume that Labor prefers to put their effort into the federal campaign for Reid. Ryde is very much in play. Liberals also appear to be worried about Epping. I feel that Lane Cove may also be interesting to watch on election night. Ryde’s north of the Parramatta River so not relevant to this article. Whilst the margin in Drummoyne IS inflated, I just can’t see it going as, whilst the current govt isn’t popular, the Lib quotient is not in the disarray that much of their Nats & federal counterparts are and there isn’t the sense that there’s a landslide result coming up. Nor is there the major local discontent with the govt and/or the sitting member that would hint at an “anomaly” swing against them in this seat. As for the thrust of this article; there’s little that I can quibble with. Coogee looks a likely loss but elsewhere on that map, its “long shots” when it comes to both Oatley & Heathcote. Of those, I would agree that Heathcote looks the better chance for Lab hence the Libs “sandbagging” efforts. This result will hinge on who wins the Heathcote – Engadine area as its a fairly safe bet that the Menai area should hold up for Libs. Whilst I can see the Lab vote strengthening in the northern half of Oatley; much of the southern half of Oatley is fairly “rusted on” Lib and not likely to swing sufficiently to unseat the Lib member. Not seeing Greens losing either Balmain or Newtown this time round. Sydney is most likely an Ind hold. What wasn’t covered in this article is the very marginal Lab held Strathfield. Whilst the overall feel of this election appears modestly in favour of Lab. there are some very mixed demographics and the margin IS very tight. Whilst I take the comments posted on the Strathfield page by probable Lib campaigners/supporters with the requisite caution, Lab cannot take this seat for granted and if there is going to be one that goes against the prevailing tide then this seat has to be a prime contender. WW, I can agree with you regarding Ryde being in play as the margin still is somewhat inflated but Dominello doesn’t have the unpopularity factor that some previous Libs have carried when this seat has been hotly contested (think 1999 with Photios). Epping ?? Struggling to see it being seriously at risk. Whilst there quite possibly is some turn-off factor with Perottet being dumped into the seat and there is some potential for some swing along the railway corridor but the western portion is what pads out the margin and I’m not seeing a major collapse in the Lib vote in that area ! And where is this protest vote going to go ? There’s no word of any Ind gaining any real traction and outside the railway corridor, this is true “tiger country” for both Lab and Lib candidates. Lane Cove ?? Not happening so long as Hunters Hill and Greenwich are major components of the seat. Perrottet will definitely win Epping. He will lose a chunk of the vote because of the circumstances how he switched seats, but he will remain in Parliament. If the Liberals lose government, he will edge out Andrew Constance to be the next opposition leader, unless he wants to hide around until he has a proper shot at being Premier. It should be noted that Ryde was once held by former Labor Deputy Premier John Watkins. It was solid Labor until it was lost in a 2008 byelection. In a big “change” election you would expect it to switch parties back. Ryde does seem to be an oversight here; it’s definitely competitive. Jerome Laxale is giving Victor Dominello a serious fright, with overdevelopment a massive issue. A seat poll two weeks ago had Labor within striking distance. Epping is apparently a concern for the Libs too, but it’s hard to see them losing it. LD, when Ryde was re-created for the 99 election; it was constructed from the western parts of the abolished seat of Gladesville; some eastern areas of the abolished seat of Eastwood and a major slice of the abolished seat of Ermington. That election saw two sitting members going against each other; John Watkins (Lab – Gladesvlle) and Michael Photios (Lib – Ermington). The electoral climate at the time was very much in Lab favour and the public perception of Photios was not overwhelmingly positive. This seat is fully contained within the federal seat of Bennelong and the swing against Alexander at the 2018 by-election was not overly violent. Conversely, Lab made major gains including Mayoralty on Ryde council at 2017 local govt elections. This suggests (1) there is considerable discontent in much of this seat re local/planning issues and (2) there is a pivotal and significant percentage of the electorate who are not rusted on to either major party and thus liable to administer the electoral “order of the boot” to either when sufficiently aggrieved. Dominello DOES still have a tidy margin to play with and doesn’t have the negative personal perception that is sometimes a “multiplier factor” to the adverse swing but in the case of landslides, even most well perceived sitting MPs get washed away. I don’t think we’ve got a potential landslide in the offing but there appears some solid evidence that we are going to see some major swings in certain seats ….. and with certain state issues biting hard in this area; its hard not to see Ryde being one of them. Anyway, I agree Ryde, where “overdevelopment” is such a big issue, is in play… But “overdevelopment” (and I’m using quotes because it is a ridiculous word which can mean anything at all) is a big issue in all these eastern Sydney seats. But guess what – everyone is against it, absolutely everyone. Doesn’t all that negativity cancel it all out as a factor? In Ryde, Dominello is against it, Laxale is against it, and they’re pointing the finger at each another for the towers at North Ryde. The Greens are against it, of course they are and I’m sure all the other candidates are too. 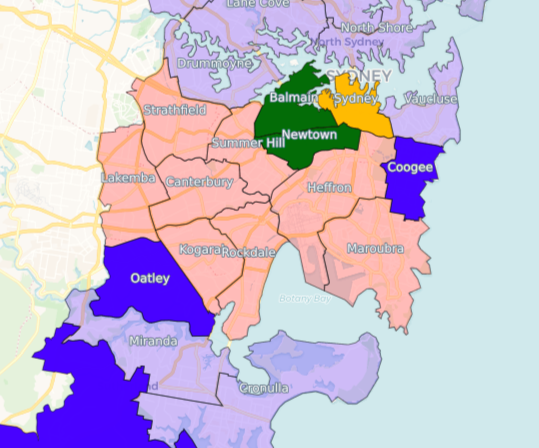 Is anyone standing for “overdevelopment” – in any of these Sydney seats? It does make me smile to think that only 8 years Labor was on the nose because of the same issue (amongst other things) and the Coalition was going to fix all that – presumably by banning cranes from Sydney’s skyline and putting the vast bulk of Sydney’s tradies out of work. And now sitting Coalition MPs are copping it for exactly the same reason – that in reality, we all need a roof over heads. Hopefully someone will still provide us one – no matter who wins all these Sydney seats.